Craig Steven’s deposition revealed not only that he was a paid fractivist, not a victim, but also the nature of the Dimock water quality hustle. The Dimock water quality hustle has been going on for a decade already, but the true nature of the whole thing is revealed in Craig Steven’s recent deposition, which is now matter of public record. Tuesday, I used the deposition to illustrate how Stevens had been recruited and paid to play the victim on behalf of Food & Water Watch and the Catskill Mountainkeeper. That was bad enough, but there are other revelations just as astonishing. Among them is the manner in which the Dimock water quality narrative was manufactured. That Dimock water quality narrative, of course, has assigned complete and absolute responsibility for any water quality problems experienced in Dimock to Cabot Oil & Gas. Nothing else has mattered to the propagandists; not the burning spring water at Salt Springs reported two centuries ago, not the EPA study and not the evidence from early geological surveys. None of that has altered the mindset determined to believe each and every instance of high methane, arsenic in the water, etc. has been 100% the fault of cabot Oil & Gas, even in cases such as Ray Kemble’s where his water well was in the midst of a junkyard. Q. Do you know what benzene is? A. What benzene is, yes. A. It’s a highly cancer causing chemical that can come out — it can be in water or it can be out in the air in exhaust from a compressor station or — or a C&G filling station. Q. And what about toluene, do you know what that is? Q. But also considered cancer causing, correct? A. BTEXs are highly volatile. Q. And is my understanding correct, you would not want to drink water that had benzene or toluene in it, correct? Q. And you would not consider water that had benzene or toluene in it safe to drink, correct? MR. POSEY: I’m going to object, you can answer if you know. THE WITNESS: I have no idea, but I wouldn’t — I wouldn’t drink it. Q. And would you consider water that had benzene or toluene in it to be contaminated? MR. POSEY: Objection. You can answer if you know. THE WITNESS: If it didn’t preexist in it, then I guess that’s a contaminant in water, yes, from what I’ve read. Q. Well, benzene and toluene don’t naturally occur in water, correct? A. I — I’m guessing that’s the case, I don’t seem to have any over on the other side of town from there, so I guess it doesn’t naturally occur in water. Q. Okay. Mr. Stevens, I’m handing you what’s been marked for identification purposes Cabot Exhibit 5 and Cabot Exhibit 6, those are two documents that you brought today, one is the July 7, 2008 water test result from — includes a letter from T.S. Calkins, cover letter is dated July 7, 2008, and then there is a report date of — on the next page of Northeastern Environmental Laboratories, Inc., a report date of 6/20/2008. It indicates it’s a well water sample taken on May 28, 2008, for Raymond Kemble, and that’s Exhibit 5, Cabot Exhibit 5. Cabot Exhibit 6, I’m just going to have you explain it. It appears to be just a listing — some handwriting that says Ray Kemble PA DEP water test redacted. Start with Cabot Exhibit Number 5, where did you get this document? A. I got it from Ray Kemble. Q. And did you review this document? A. I’ve looked at it, I don’t know how to exactly review everything on it, but I’ve looked at the document. Q. Okay. And you understand that this is his predrill test results, correct? Q. And you understand that his predrill test results indicated that he had the presence of benzene and toluene in his water predrill, correct? THE WITNESS: I have no idea. I get confused by the limits and the numbers on this, I just left this as a predrill test copy. Q. Okay. Well, you have stood up on video in front of committees and said that Mr. Kemble — I mean holding this exact document saying that Mr. Kemble’s water tested completely fine and there was nothing in his water. So did you actually — did you look at the document before you — you made — testified before these committees? THE WITNESS: I have no idea, I don’t — .002 looks like a pretty small number so you guys are the ones that have done thousands of water tests, Cabot has, so I’m wondering if that’s reflective of a very low number or very high, I don’t know. Q. Okay. So let me make sure I understand this. Earlier you said, we were talking, I asked you if you knew what benzene was and what toluene was and you said they were cancer causing — highly cancerous I believe you said BTEX and that you wouldn’t drink water that had it in it, and here we have Mr. Kemble’s predrill test before any drilling was done showing that he had benzene and toluene in his water and yet you stood up in front of these regulatory bodies and said that his water was totally fine before drilling, correct? THE WITNESS: Yeah, I have no idea what you’re getting at. I see very, very low numbers .002, that’s in the thousandth range. So what — do you have a copy of the one — you guys did tests every week, where is the copy showing it after the testing, maybe it was above .002. So I’m not — I’m not a water expert as far as looking at testing data, but those look like low numbers unless somebody can educate me that it’s a high number. Q. So it’s a — is a low number of benzene acceptable to you, is that what you’re saying? A. I don’t know, is a low number of methane acceptable? Q. I’m asking you is a low number of benzene in someone’s water acceptable to you? MR. POSEY: You can answer, if you know. THE WITNESS: Yeah, I — I have absolutely no idea what the — what the allowance is because there are allowance with every chemical in any kind of water. Q. Does having an allowance of a chemical in water make it acceptable to you to be in the water? THE WITNESS: I would rather if it was my water said 000, but I don’t know what the levels are that they would call acceptable. 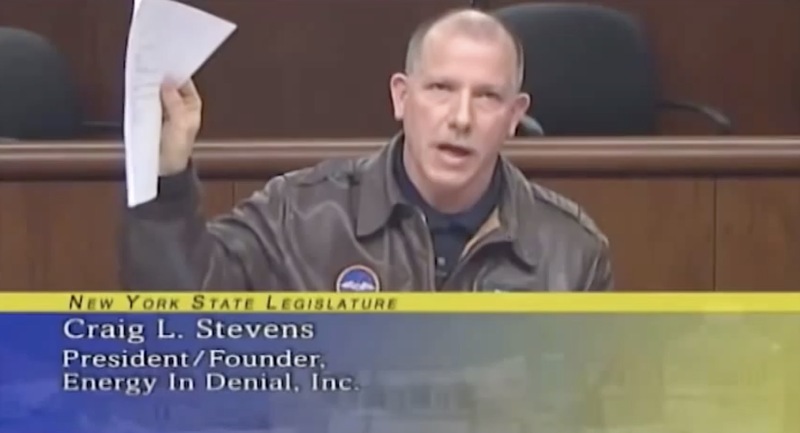 Q. I understand that, Mr. Stevens. But you were giving testimony before committees, governmental agencies and committees saying that Mr. Kemble’s water was fine beforehand; the truth is you didn’t know if his water was fine beforehand, correct? THE WITNESS: I was — I didn’t know him beforehand. All I know is from the condition I saw when it was different. Q. That’s right. So when you stood up at a hearing and you held up this test result and said his water was fine, you had no idea what you were talking about, correct? Q. But — and you’re not a water expert, correct? A. I’m not a water quality expert, no…. Q. Okay. Now, you heard what you just said, absolutely nothing in the water, correct? And you held up a copy of the predrill, correct? A. I believe I said no methane in — I thought we were going to talk about methane. Q. We’re going to talk about methane too in a minute. Q. But can you just answer my question, you said there was nothing in his water, correct? A. That’s what I said. Q. And sitting here today, you’re saying you didn’t understand these numbers, correct? A. I — those were low enough where I was told or assumed that those numbers were acceptable levels detection limit whatever that means so, yeah, I didn’t have any idea that this would be considered contaminated water. Q. Okay. So you had no idea that having a detectible levels of benzene and toluene in a predrill sample would indicate contaminated water, correct? Q. Okay. Now, you say that there was no methane detected in the water, correct? A. That’s what it says here, no hydrocarbons detected, yes. Q. That’s not my question, Mr. Stevens. You said on there, there was no methane detected in the water, correct? Q. What you said on the video, you said holding up this predrill sample, you said there was no methane detected in the water, correct? Q. Can you show me on this document, Cabot Exhibit Number 5, where there was a test for the dissolved methane in water? Q. — what that says, field notes, LEL, lower explosive limit, monitoring performed with a LEL monitor. Do you know what an LEL monitor is? A. It tests for lower explosive limits so that’s — I guess I learned it’s below 27 milligrams per liter. Q. And when — when you use an LEL meter, where are you testing for the methane? A. I have no idea, I’ve never used one. Q. So you don’t even understand what LEL — what this LEL meter was testing or where or how, correct? A. I’m not an expert on testing for methane. Q. Okay. Now, do you have an understanding or — so I guess it would come to a surprise to you to know that using an LEL meter you are actually testing for methane in the air? Q. And there’s no test on here that shows what the dissolved methane is in water that shows that his water was being tested for dissolved methane, correct? THE WITNESS: I don’t have any idea. It looks like not included in this, that portion was not included in this. Q. Okay. So you don’t know if there was dissolved methane in Mr. — Mr. Kemble’s water when you stood up there and said that in front of the New York Assembly, correct? Q. Is that how you do consulting, you consult and make statements to government officials about things that you really don’t know about? THE WITNESS: I try to be as informed as I can, but it’s hard to keep up with how much damage was done in that area. So everybody had different tests, every home had a different level of everything. So very hard to keep up with. Q. This is — you are here focusing in that video on Mr. Kemble’s water. If you were going to speak about Mr. Kemble’s water, wouldn’t it have been prudent to make sure that you knew and understood the test results about Mr. Kemble’s water? THE WITNESS: I — I’ve seen methane in his water, so the testing data — this was prior to that, but after that massive — I mean, bubbles — a lot of bubbles in glasses of water. Q. And you — and you also said that you never saw Mr. Kemble’s water prior to 2010, correct? A. Well, that’s from 2013, the video, correct? A. Okay. That’s after the fact. But, no, I did — had not seen his water before 2010. Q. So you don’t know if there — you could see methane bubbling in his water prior to 2010, correct? Q. Okay. Now, I’d like to talk about Cabot Exhibit Number 6. Could you explain — is that your handwriting at the top? Q. And can you explain what this is? A. This was DEP testing of the entire Carter Road area, each one next to there had a name but it was redacted because DEP protects the — so the list that is marked — the asterisked ones were Ray Kemble. A. He — he told me and so I — I — he marked it, so I just took his word that that’s his — because we can’t — I couldn’t see it, there was no name next to it. Q. So you just took Mr. Kemble’s word that these test results reflected his water? A. That those asterisked items were reflecting his — I don’t see any names on here so — it’s redacted, so that’s what I got it from and that’s what I was told. Q. And so you were using this to demonstrate contamination in Mr. Kemble’s water, correct? A. To demonstrate contamination stating that this is Ray — this is Ray Kemble’s water, that I was told this is Ray Kemble’s water and the asterisked items were from his tests. Q. And you have no idea, in truth, whether this even reflects Mr. Kemble’s water? A. Well, I understand there’s copies of unredacted, but they weren’t made available, so I have to take his word for it. Q. So, again, my question is you have no idea whether this — the asterisks represent Mr. Kemble’s water? Q. So that’s a yes, you have no idea, correct? Q. Now, you are aware Mr. Kemble has had other water tests done on his water, correct? Q. Have you seen those test results? Q. And so did you ever ask Mr. Kemble for a copy of his test results? A. No, I don’t have any other copies of his — of his test results besides those and that’s just marked. Q. My question is did you ever ask him for any other copies of his test results? A. If I had these and that’s what he had marked, so I just took those. Q. And so even though he had other test results done by the EPA and by ATSTR, you never asked him to see copies of those results, correct? MR. POSEY: Objection. Asked and answered. THE WITNESS: Yeah, the EPA and ATSTR were marked, were not put names on either, there — they have a special nomenclature for it, so I don’t know which ones of those were whose. So, no, I didn’t. Q. Are you aware Mr. Kemble just had test results done in 2017 by both the DEP and again by ATSTR? Q. And are you aware that they gave him copies of his test results? A. I haven’t — I didn’t review those. I haven’t seen them. Q. And did you ask Mr. Kemble for them? A. There was no reason for it. Q. There was no reason for it? Wouldn’t you want to see if the water got better? A. He’ll — I guess he would tell me if the water was better or not. Q. Wouldn’t that be important for you to know that — if his water turned up clean by the DEP? THE WITNESS: So I’ve gotten to the point in ten — nine years of I don’t care what the water test said, if I go turn the water on and it comes out smelling like a skunk, brown and bubbly, then there’s a problem. I’m not going to be a — I don’t have to be Bill Nye, the science guy, to figure out there might be some problems with the water. So so many tests were done at so many different parameters that I just go by the visual, by the odor, color, taste, clarity. Of course, I didn’t taste it, but I’m just looking at what parameters of change would be noticed and that’s what I see when I go to somebody’s house to look at their water. A lot of them have a lot of test results. Q. And you have no idea whether anything about the color or clarity of Mr. Kemble’s water is the result of Cabot’s operations, correct? A. Do I know? I know that the claim is the change was made after the fact, but did I see the water before, no. Q. So you didn’t see the water before, you haven’t looked at any test results other than the two that we’ve just looked at, and yet you’re going around the country with a jug of water claiming that Cabot, in particular, has contaminated Mr. Kemble’s water, correct? THE WITNESS: Yeah, I’m — I’m — First Amendment says I can speak, so I’ve been — the other sites we mentioned have been abused a lot for everything I’m doing, so I’m sure that’s Cabot’s supporters. So I’m going around and my free speech rights says I can go and talk about water quality issues wherever I want to. Q. That’s right. And earlier I had actually talked to you about looking at records and you said yes, you would want to look at the records to make sure that the statements you were making were truthful and accurate, correct? Q. And now as we sit here today we know that you didn’t even understand the records, you haven’t looked at any recent records, but yet you’re still going around and telling people and holding up a jug of water and telling people that Cabot has contaminated people’s water, correct? Amazing. That’s what you call a total demolition of the Dimock water quality narrative Food & Water Watch and Catskill Mountainkeeper paid Craig Stevens to advance. And, if you were wondering what those ATSDR and DEP test results in which Stevens showed no interest might have said, well you can find them here, because they were posted on-line by Stevens and Kemble friend Bill Huston. Funny that he never looked at them, isn’t it? It’s as if Stevens and company have never wanted the truth out about Dimock water quality, isn’t it? That is amazing!! You will never see comments about this in the main stream media. The anti-everything crowd, get all the news coverage. It is really amazing how unethical these anti-gas people are. Aren’t there laws against false testimony before government committees, even if Mr. Steven has his free speech rights to talk, doesn’t he have to be held to some standard of truthfulness? This is similar to yelling “Fire” in a crowded theatre, when there is no fire. I too testified at that hearing. I saw Craig Stevens and his Brown jug and I asked security if they knew what was in that jug and if it was a threat to the people in the audience? LOL… they said they didn’t know. No comment from Jan/Hope today? You know predrill testing showed no hydrocarbons, right? Propaganda = saying salt springs refutes the predrill testing showing no hydrocarbons in the water. Tom – you are here to do Cabot’s bidding, which is demonize and harass Cabot’s water pollution victims. That plays well in this little world you’ve’ created. When you take that out into the real world you and Phelim really look like such schmucks. The scene that amazes people the most in the film is of you and Dimock Proud on the launch of your campaign to smear Dimock victims. Marching with signs calling these real victims liars … People gasp – when all of this goes very public – how do you plan to come out not looking like a shill paid to demean real victims? My last chemistry class was in ’72. Back then benzene was a hydrocarbon. Pretty sure it still is. Benzene in water = hydrocarbons in water. From my read of the transcript it looks like the LEL meter detected no hydrocarbons. LEL meter measures hydrocarbons in the air. Nothing to do with what is in water. I think I’ll go with the lab that did the water testing over your memory from 1972 chem class. Thanks though. It seems a mental habit for people here to look for ways to call these victims liars. Tom has been at it for about a decade. Now when people say my water was fine – we’ve lived here for generations, our water was always clean before drilling/fracking occurred – industry and their supporters are trained to call them all liars out for fast cash. Don Siegel also documented that most methane migration is natural. Thank you for reliable posting of the gas industry’s position. Yes – much naturally occurring methane. None of that naturally occurring methane is relevant when the victims have predrill testing showing no methane in the water as is the case in Dimock. After a decade Tom, i think you could use your critical thinking skills to understand how predrill testing refutes naturally occurring methane. But then again no one likes to respect a fact when their paycheck relies in them not accepting that fact. Jan, what lab? Samples taken on which dates? Information provided to the DEP on which dates? Where were the samples taken, and who did it? Who at the DEP was given this information and failed to act? Show me the data. Give me some names. You fuss and fuss and talk about videos. I run numbers and provide references. See the difference? Please post the water sample results they are talking about in this deposition. The guy admits there is benzene and toluene in the predrill samples. He also said the no hydrocarbons was in connection with LEL readings. LEL meter isn’t measuring hydrocarbons in water. Anybody got a copy of the actual sample. You can easily find the answers to all of that by inquiring with DEP. The predrill testing I post in the film speaks for itself. I can’t share people’s private testing with you. Not legal. All this time have you not done that research?? I spent hours talking with the victims themselves reviewing their testing. How many victims have you interviewed or seen their testing results?? Jan,nice try to divert attention calling the water quality at Salt Springs State Park “propaganda”. It’s a fact. The water quality there is bad, had been bad, and that’s been true for years. I said the predrill testing showed no hydrocrabons in this water. In that case how is the methane level at Salt Springs relevant? This is a gas industry tactic. Even though predrill testing showing go methane in the water .. industry in cases where predrill shows no methane .. will still claim the methane being complained about was always in the water. please focus on what I say instead of sticking to your talking points. Years of ground water testing clearly indicate that ground water quality in shallow wells in PA (and in NY) frequently do not meet Federal water quality standards for one or more “contaminants”. Methane is one, and you can also find aluminum, barium, zinc, lithium, iron, manganese, sodium, chlorides, sulphates: it’s a long list. These are “contaminants” because they exceed a carefully chosen set of Federal standards designed by scientists concerned about effects on human health. On the other hand, since these same “contaminants” are found in nature at levels that may vary in time and space with no human intervention, you can also characterize this as nature at work. These “contaminants” were there long before the natural gas industry started doing anything. Not all modern lab tests that find these things are locating “contamination” from natural gas development. It was already there. And that’s a point about water quality that I was trying to make by using the Salt Springs State Park as an example. That water has been known to be bad for centuries. Nowhere did I say “The methane in the water at Salt Springs State Park”, you assumed it. There are also a number of relevant USGS studies for NY and PA. I also think that the lab results from some tests do demonstrate increased levels of these and other substances do come from human activity, which can include coal mining, salting roads in the winter, agriculture (animal waste and fertilization of fields), road construction, industrial accidents, golf courses, sewage systems, septic systems . . . and so on: including natural gas development. Sorting out the cause of increased levels in any specific case required examination of the facts, not a reflexive “It’s Cabot’s fault.” Maybe it is, maybe it isn’t. Let’s find out. No- Cabot polluting these water wells was not “nature at work”. Predrill testing showed no methane. Naturally occurring methane is not relevant when testing showed there was none in the water before drilling. Yes – miles away a spring is high in pollutants/methane … does the predrill testing tell you that methane was in this water before drilling? I know – this is a really really hard concept for many here. Does testing showing no methane in water before drilling mean there was no methane in the water before drilling? Maybe get in a dark quiet room, think on it for a bit, you might be able to divine the answer. Your long diatribe there about how naturally occurring methane/pollutants refute predrill testing showing no methane was very informative as to the lengths people will go to here to make an argument that is overtly silly. If you can’t understand how testing showing no methane in the water before drilling proves there was no methane in the water before drilling I surely can’t help you. Refer to the isotopic testing I mentioned earlier. Do you understand how predrill testing showing no methane in the water refutes naturally occurring methane in the water? Look into it – it’s a very hard concept for people from your side, but you can master the knowledge if you really try. The pre-drill tests did NOT show no methane, Jan. That’s the point you refuse to accept. Ok = prove it, Tom. I’ll wait. I posted my evidence of such, now you post your evidence. How do you get around isotopic testing that matched the gas to Cabot? It’s all in the transcript and I already summarized it. No where is that WPX evidence. I’m cutting you off again after this set of comments if you don’t provide it or retract your allegation. Not legal – you can get them redacted from DEP. All the families had predrill testing, all showed no methane. I know that from talking with these victims. Cabot just had those predrill findings thrown out once Cabot polluted the aquifer. They did the same in the Shanti Temple case. “All the families had pre-drill testing, all showed no methane” . . . but samples taken on May 28, 2008 and July 7, 2008 from Ray Kembles’s well identified benzene and toluene, as described in the Stevens deposition. The total results of the two lab tests were not disclosed in the discussion during the deposition. And who are “all the families”? Are you only referring to the 19 listed in the December 2010 Consent Order? And if they have the lab results, why don’t you ask them for permission to publish them? If those results exist, then publishing them would only help their cases. I’d be fine with that, as long as we get to see pre-drilling, post-drilling, and the 8 quarterly samples Cabot was required to take after the levels were reduced by remediation. I don’t question that DEP concluded that 18 drinking water supplies serving 19 homes in the Dimock/Carter Road Area were affected. What I haven’t seen is any evidence that after Cabot competed the remedial actions required by the DEP, which included at least 2 years of water testing at quarterly intervals, the water in those wells remained affected by the actions of Cabot. If the water was still bad, DEP should not have let Cabot stop working on fixes. Since DEP did let Cabot stop, until shown compelling evidence, I have to assume that the remedial actions did as they were intended to do. And how does “Cabot just had those predrill findings thrown out” work? Is that a result of a court action, or did an elite team of Cabot Ninja warriors break into all the labs and all the homes and the DEP paper and on-line files to destroy evidence? The letters I’ve seen from the DEP to land owners are redacted so you can’t identify the names or locations, and the text usually says something like “lab results as provided in the attachment” which is not included in the pdf versions I’ve been able to find. So if the results are not included and the names and addresses are redacted, how do I get useful lab information that can be correlated to individual wells and specific companies? Show me how to find evidence that I can use. There is a link to a dropbox on Huston’s page. They have 2017 water test results done by the state and the feds. His water is clean. The tester also noted no odor and no discoloration when the sample was collected. I had an open mind until I read that transcript man. Good reason not to rely on a transcript to form an opinion on testing. Can you imagine why people don’t offer up their testing to people who use it for one singular reason – to frame those victims as liars and frauds? Barry – did Cabot’s leaky water wells pollute the aquifer under Dimock in 2009? Did DEP do isotopic testing matching the gas in the water to Cabot gas? Lets start there .. can you get that far? As for the water today, many of the original families are still on filtration systems, at least two people on those systems are now dead (just saying – as a Parrish contact I have who installed such systems explained Cabot always knew they never really worked), and a few of the houses still have high levels of methane. I’ve never said Cabot is still polluting Dimock, they are in a 9 mile ban there and DEP won;t allow fracking again since the last round polluted more water. “Good reason not to rely on a transcript to form an opinion on testing.” No fooling. That’s why I don’t do it. And it’s why I keep asking you to produce evidence that’s not redacted . . . . in other words, evidence that can be correlated to other information. “Barry – did Cabot’s leaky water wells pollute the aquifer under Dimock in 2009?” No, it was Cabot’s gas wells that appear to have polluted several individual water wells in 2008/2009. We have not managed to agree on a definition of what the “Dimock acquifer: is: location depth, extend, preconditions, conditions in 2012, 2017, and today. “Did DEP do isotopic testing matching the gas in the water to Cabot gas?” I don’t know. The lab results referred to in the letters I have access to (or have found so far) tend to be provided in appendicies to the DEP letters, and those appendicies are not included in the on-line PDF versions of the DEP letters to the (redacted) water well owners. “I’ve never said Cabot is still polluting Dimock,” so if Cabot is no longer polluting Dimock, and if they have met the requirements imposed by the DEP, and if current testing does not indicate additional Cabot-created or Cabot-caused contamination . . . .what’s the fuss? If some people refused to allow Cabot to install water treatement systems, and have not installed treatment systems of their preference, and those people have been told that their water is unsafe . . . . why should we have any sympathy for folks who (1) refuse to take remedial action they know the should, and who (2) remain in the same location? After all, they could have bought water treatment systems from Craig Stevens, right? Catskill Mountainkeeper and Food and Water Watch were paying for Craig to pay Ray to deliver water, right? “they are in a 9 mile ban there”: reference please? The wells drilled by Cabot in the Dimock/Carter Road Area are still in place and still producing, right? What was banned? “DEP won;t allow fracking again since the last round polluted more water.” You are referring to the hydraulic fracturing DEP allowed in 2012, right? Once that was completed, did Cabot drill additional wells in the Dimock/Carter Road Area and ask for permission to conduct hydraulic fracturing? Do you have a reference to back up your “won’t allow” comment? When I look at the Dimock area using Google Earth, and look at the locations and proximity of the well pads, and compare that with well pads in other areas of northern PA, it looks to me as if one of the things that has happened since drilling started is that the spacing between well pads has significantly expanded. That is, the newer wells are farther apart. I’m not a geologist or gas systems engineer, but I think this is part of what I’ve referred to in other posts: the engineering technology has evolved and the industry is doing things in smarter and safer ways with better equipment and more highly trained personnel. I think that a major contributing factor to the water quality problems in Dimock is that the wells were being drilled too close together. How do you know what was shown in the deposition? The transcript shows no testing for methane in water was done. That Stevens guy never said anything about not being shown the full predrill. I went back and reread that part and it shows that Steven’s produced those tests and admitted that they were the predrill. And in your video you lie. You show the portion of the predrill referring to the LEL meter and say “no hydrocarbons.” But you know that comment only related to air testing with the monitor. You are a proven liar by your own video. What is Shanti Temple case? Never heard of it. Are you saying the company polluted the aquifer there and then destroyed predrill tests? How many water supplies involved? You can inquire w/ DEP about Shanty Temple. Yes – Cabot polluted the aquifer and the had DEP throw out the predrill testing. In terms of water quality though all the families (at least 20) had lived in Dimock for years and some for generations. Their water was good until Cabot drilled/fracked. Cabot and their PR people still deny Cabot was involved though isotopic testing shows it was Cabot’s gas in the water. You have proof that Cabot had the DEP throw out predrill? You did not answer how many water supplies impacted. How many? If aquifer contaminated there should be plenty of families. And what did the water get contaminated with? Jan / HopeforCash states: “All the families had predrill testing, all showed no methane. I know that from talking with these victims.” So this is hearsay. Means nothing. Who’s paying you to say things like Stevens did all these years? Catskill Mountainkeeper, Food and Water Watch, Park Foundation? Who? Also, when did you “talk” to the “victims”? Before or after NDA’s were agreed to? With regard to an NDA: no one is ever forced to sign on. It is strictly voluntary and a lot of money is usually involved. Your characterization of an NDA as a “gag order” is what paid fractivists use all the time. I love that you posted that Tom .. such a great example of the mindset you are so proud to have created here. Jan you lie. I was able to get the predrill off of that Huston guy’s dropbox. They show benzene and toluene in the Kemble guy’s water predrill. Those are hydrocarbons. The “no hydrocarbons” reference was next to a comment about the LEL meter reading. The LEL monitor did not test water. You lie about basic chemistry. That is why you have no credibility. Who said it is illegal to post water test results? Huston has them posted. And if these people have such bad water, why wouldn’t they give you permission to post them to show the world? You spent “hours” talking with them but nobody gave you permission to post their results? No credibility Jan. I decided to take your suggestion and research. Your Nov 7 2014 video discussing the water sample shows what a liar you are. I notice you edit out part of your own comments. And you do not show the public the benzene or toluene. Yes – it is illegal to post other people’s private water testing. And since this site has been devoted to calling them liars no victims would participate here obviously. Please post where Ray’s predrill testing showed 25K PPM of methane … that’s the reading in 2010 after Cabot Drilled. How do you throw out the Consent Orders? I’m curious Mark, do you admit that Cabot polluted this aquifer in 2009 – ruining the water supplied of 20 homes? Or do you deny that? This is your last comment until you address the WPX allegation. Provide the evidence or retract your allegation if you want to comment any more. What proof are you looking for Tom? Pictures of WPX cutting the wires? The cut wires in the water well? What exactly do you want as evidence? Any incontrovertible evidence at all that this is what happened. Jan post the predrill showing no methane. If you had it, you would post it. Based on the transcript the predrill never tested methane in water. No wonder you got no funding. Even the NGOs could see that you have no credibility. Jan, if you have real laboratory evidence to back up your claims, you and everyone of those families you talk about, would surely share them, bring them to the attention of the authorities, DEP, etc. But to keep talking around this matter as if your word, with no back up evidence, is the absolute truth will not sway anyone other than those that want to believe in a conspiracy. I cannot believe that the PA DEP or any other legal entity would ignore any real evidence that is available, so I must come to the conclusion that you have none of the evidence about water contamination caused by drilling, that you are deliberately misleading people just because you are opposed to gas drilling. Ken – I posted the isotopic evidence here. If you’d like to look into the DImock case, please start with the three consent orders from DEP. Easily found. Ummm … DEP DID testing/filed the consent orders. You could even just search Dimock water pollution and get a good start. Tom and his team have been working for a decade to call these victims liars. it looks to me like the worst-case number from the available data would be 243 complaints after over 7,000 gas wells were drilled in PA. My count is that the 243 complaints correlate to 198 distinct water sources. Reviewing the DEP list, it looks like 82 were resolved, 42 of them with no action required, so there are 198 – 82 = 116 water sources for which we do not know how they were resolved. 116 divided by 7,000 wells drilled since 2009 is not much of an error rate: it’s about 2 per month. their drinking water from over 1,000,000 private wells. Around 20,000 new wells are drilled in PA each year. According to data from the The Center for Rural Pennsylvania, 40% of all PA private fresh water wells do not meet at least one federal water standard. This suggests that over 400,000 fresh water wells are unsafe, and 8,000 new unsafe water wells are drilled each year in PA. Why is it that 243 water sources damaged over a period of several years . . . . that’s about two per month . . are such a tragedy and raise so much ire, when there are 8,000 wells per year, or around 22 new wells per day, put into service without meeting federal water standards? Where’s the outcry over these public health hazards? here is statement to EPA by our retired, former School Superintendent of Mt. View Schools, Mr. Andrew Chichura, of Kingsley, Pa.
and his water woes since gas drilling near him and he received water from Cabot for several years and DEP verified he and several neighbors were contaminated by gas drilling done by Cabot. He sued Cabot in court and received a settlement and now under non-disclosure agreement/gag order like many. It’s just not Dimock in my county. It’s spread throughout my county and with other gas companies culpable besides Cabot. Most silent or silenced and many afraid to speak especially as they see how those who speak out are treated and taken to court. Your assertions simply are backed up by the data, Vera. There can be occasional stray gas migration but it can come from numerous things, as well gas drilling, and rarely happens now. It happened at Owego, in fact, when they drilled geothermal wells at their school. The three wells listed in the Sep 19, 2011 Notice of Violation to Cabot were inspected multiple times. Casing problems were found and fixed. Cabot got sued and the plaintifs won. Once again we see that the early technology used for cementing well casings was inadequate, and that has been fixed. Statler 2H, permit 115-20496, has had no violations noted in 27 site inspections between 6/27/2011 and 1/23/17. Statler 8H was inspected on 12/05/10, well status listed as “Plugged OG Well”, which has been the status for all inspections since 12/05/11. Additional inspections on 12/22/10, and 2/1/11 had no violations noted. An inspection on 4/20/11 found violations. Status onths well has changed several times from “no Violations Noted” to Violatins Noted” to Outstanding Violations – No Viols Req’d”, and the last 3 inspections in 2017 all were “No Violations Noted”. Did you look at the EPA PowerPoint? Did you look at the alleged Gas Migration investagation/GW Vistas done by Cabot, Lindsay Byron & Pelepko (DEP). Are you aware a resident was made to fill out a rtk request with the dep to find out what was done on their property & that the dep denied the request at first? Are you aware that a resident was told no records were kept by the dep or driller as to what was done on their property? not able to be denied or disputed. Tom – no matter WHAT I posted – lets say I posted pictures of the wires in the hole – you would say that pics are a lie. I imagine if I had the operator live on film cutting the wires, unless they said they were cutting the wires on film- you would not buy it. WPX did do this – but you always side with industry as paid, so you can never face the horrors these operators put families through. You frame all these victims as liars- it’s how you seem to make your living. .. but hey – fun working with you – got lots of great new material here. Thanks. I’m wasting too much time here trying to help your poor uninformed base anyway. See you on the battlefield. So, you don’t have any evidence, as I suspected. You accused WPX of something about which you had no idea whether it was true or not. Enough said.